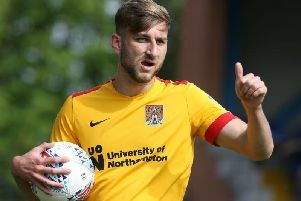 Carabao has teamed up with the Chronicle & Echo to give five lucky Cobblers fans the chance to win a pair of tickets to Town v Oxford United this weekend. Carabao Energy Drink, established 15 years ago in Thailand, the home of energy drinks, is a premium, great tasting energy boost, designed to give consumers the energy they need to achieve their everyday goals. Carabao is currently stocked in Morrisons, Co-op, WHSmith Travel, One Stop, Booker, BP and Greene King as well as a significant number of independent retailers. To be in with a chance of winning a pair of tickets, simply answer the following question: Who scored the Cobblers’ second goal in their 2-1 win over Oxford United at the Kassam Stadium in November? The closing date for the competition is 10am on Thursday, February 22. 1 The prize is for five winners to win a pair of tickets for Northampton Town vs Oxford United on 24th February 2018. 4 Carabao will inform winners within 24 hours after the competition has closed. Winners must confirm no later than 17th Nov and provide their address. Tickets will be available for collection on the day of the match. Collection point details will be provided by the Promoter once eligibility checks have been completed by the relevant football club. 6 Winners will be picked at random by Northampton Chronicle & Echo from those that correctly answer the question in relation to the advertised competition. The Prize Draw will be supervised by an independent person. 25 Entrants will be deemed to have accepted these T&Cs and agreed to be bound by them when entering this Promotion. All other Northampton Chronicle & Echo terms and conditions apply.